Ananka's Diary: Watch Out California! Ohh! That is REALLY scary! How do they eat something so much bigger then them? bu--but i live in CA.!!!! at least i don't live near the bay are!!!! i'm safe in Central Valley, right?!? Sffh, snakes jaws are not connected,like ours are by thick muscle and bone. they are connected by a disk that pops out of place if need be. The stretchy skin around their mouths widens enough to swallow the the animal. Another useful adaptation is their windpipe. no matter how stretchy its jaw becomes it usually takes an hour or more to swallow their prey. Obviously the snake must have oxygen to breath but it's impossible to take air in when your half way through a ginormous alligator sandwich. So, the snake mooves its windpipe down and out the bottom of it's jaw, wow, eating and breathing at the same time, useful isn't it! They can eat alligators and bevers?! What about people can they eat us too? scary! Eek! Beavers?? Maybe they'd do us a favor and visit the Shadow City for us...all you can eat for free! I hope they do landmark them. And that guy is SMILING as he holds the snake's tail?!?!?!!?!?!?!!?!?!? Awesome! I'm like in love with Burmese pythons. There was this one at our zoo and I went home and drew a picture of it and called it "flat Burmese python". 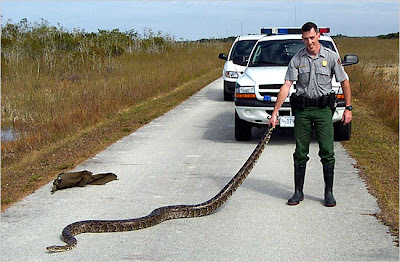 That guy is a little crazy, "oh look, a giant snake! lets hold on to it's tail and maybe it will get mad at me and strangle me! Cool!" I am overjoyed that I don't live in Cali! Thanks anonymous! Wow, that is crazy how their jaws aren't connected!